This tutorial will demonstrate how to frag a Pavona coral (common name Cactus Coral). The photo on the right shows the coral I'll be fragging. I have removed the coral from the reef aquarium to take the cutting. Another option for fragging this coral is the slow and patient way. As you can see in the photo to the right I have attached some shells onth the rock with a dab of superglue just below where the coral was encrusting. It is difficult to see in the photo but the pavona is begining to encrust onto the shells. Eventually you could break off the shells when they are completely encrusted. I will be using a pair of stainless steel bone cutters to take my cuttings. The photo on the right shows the piece I have selected to frag. Cuting tools are not required as the upward growing plates will break off pretty easily. 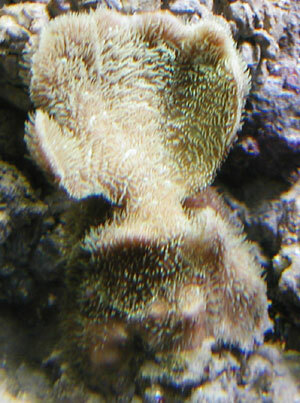 This photo shows the frag that has been removed from the colony. After your frag has been cut, you can now super glue it to a piece of rubble. Squeeze out some super glue on to the rubble and hold the frag in place. After about 30 seconds the glue should hold the frag in place. At this point you can place the frag back into your tank. Here is a pic a couple of months later. It has now almost fully encrusted the piece of rubble it was originally attached to.